Each $76 box contains 14 packs. Each pack contains 6 cards. 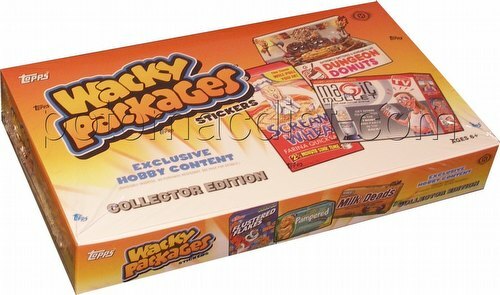 There are 55 new stickers in the Wacky Packages Series 10 base set. 27 of the card backs feature a mix of 9-card puzzles. 27 of the card backs feature new Wacky Billboard and Movie poster advertisements and Wacky product coupons. Collector Packs include exclusive content. Every box includes either a Sketch card, Printing Plate, Artist Auto, or Buy Back card. Other inserts include Lost Wacky (1 per case), Ludlow Black Commemorative (1:box), Ludlow Red Commemorative (1:case), Collector's Bonus Card (1:box), Gold Base Parallel (2:case), Cloth Sticker Parallel (4:case), Red Base Parallel(1:pack), Black Card Parallel (1:pack), and Wacky Oversized Bill Board (1:box).